Competition Champion Goal Kicker: 1872 - 6 Goals. J. A. Donovan : "Our Own Jack"
1869 "One of the most brilliant players of his time, at a charge unequalled"
Jack Donovan (above) is pictured with the Carlton team in 1881 in Adelaide. Jack was the team manager. "The Dark Blue played seven Grand matches this season, won five, drew one, lost one. They compiled ten goals and had only two kicked against them. Carlton were declared official champions for the season, but Melbourne claimed the title and continued to dispute the Carlton triumph long after all participants had passed on." One of Carlton's stars of the early 1870's. 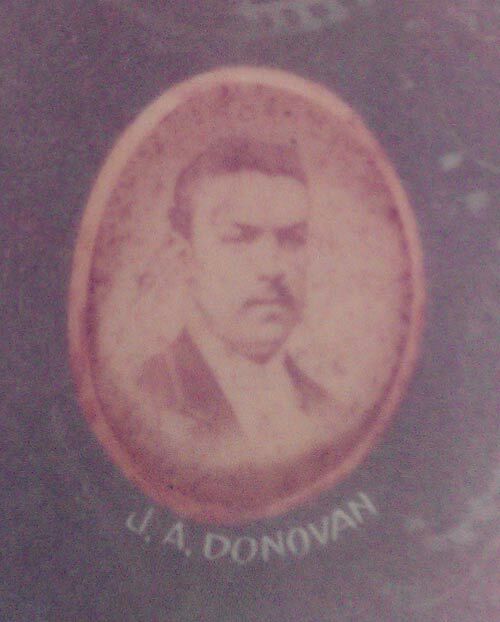 1870 Jack Donovan played in the Carlton team for the new Challenge Cup competition against Albert Park on June 18 1870. 1871 Donovan was Captain, and led Carlton to their first premiership and the first year Carlton had abandoned the orange cap in favour of one of dark blue. Donovan was captain of the side against Melbourne August 5 when Jack Conway was injured. 1871 Played against a Richmond 20 at Richmond Park July 15. 1872 Jack was presented with an illuminated address for his captaincy and leadership in securing for the club The Challenge Cup. The original manuscript is in the M.C.G. 's Gallery of Sport. Blueseum has been invited to photograph the document for display on this site. Competition leading goal kicker in 1872. 6 goals. Carlton played Albert Park in Royal Park. In this game there was a disputed "no goal" decision given by the goal umpire. This resulted in a number of letters being written to The Argus. Jack Donovan got involved and wrote to the newspaper about the "incident." 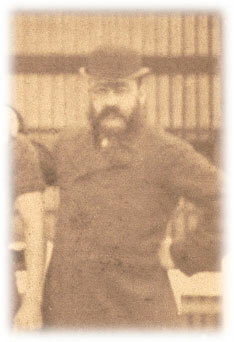 1881 J. Donovan was the team manager for Carlton's visit to Adelaide. See 1881 page for team photo taken in Adelaide. Possibly Jack Donovan standing far right in the photo. At the first game held at Princes Park June 22 1897 Carlton stalwarts of the past including Jack Donovan, John Gardiner, George Robertson and Billy Donaldson attended. A dozen of coves on the slippery grass." Captained the Blues in a ex players Charity Match against Geelong at Geelong to raise money for the local hospital. At the Carlton AGM, J. Donovan is elected as co Vice President of the club. Retired from the presidency of the St. Kilda Bowling Club.
.* John Augustine Donovan (husband of Mary) born 1852, died on the 19 October at Lockhart Street Caulfield aged 82, buried at the Melbourne General Cemetery. Same person? Contributors to this page: blueycarlton , Jarusa , pblue and molsey . Page last modified on Monday 04 of September, 2017 09:34:43 AEST by blueycarlton.